For twelve-year-old Cora Landry and her friends Violet and Jordyn, it was supposed to be an ordinary sleepover--movies and Ouija and talking about boys. But when they decide to sne A gripping thriller about three young girlfriends, a dark obsession and a chilling crime that shakes up a quiet Iowa town, from the New York Times bestselling author of The Weight of Silence . To ask other readers questions about Before She Was Found, please sign up. The description sounds very similar to the Slender Man case. Is the book based on that true crime? MaryAnn Heather refers to that case in the reader guide as an inspiration but then made it her own plot. It was supposed to be a sleepover Three twelve-year-old girls, Cora, Violet and Jordyn, were having a sleepover at Cora's home. But then the trio decided to sneak out of Cora's home at midnight to go to the abandoned rail-yard. It was supposed to be a fun adventure. It turned into a nightmare. Cora is found on the tracks by a woman walking her dog. She is covered in blood and barely alive. Violet and Jordyn are nowhere to be found. Later Violet is found and taken to the hospital and Jordyn turns It was supposed to be a sleepover Three twelve-year-old girls, Cora, Violet and Jordyn, were having a sleepover at Cora's home. But then the trio decided to sneak out of Cora's home at midnight to go to the abandoned rail-yard. It was supposed to be a fun adventure. It turned into a nightmare. Cora is found on the tracks by a woman walking her dog. She is covered in blood and barely alive. Violet and Jordyn are nowhere to be found. Later Violet is found and taken to the hospital and Jordyn turns up at the home she shares with her grandparents. Violet is in shock and Jordyn is moody with her mood alternating from indifference, to fear, to defiance. This book is told through text messages, journal entries, therapists notes and through the perspectives of various family members. As the book progresses, the reader learns more about the girls, their relationships with each other, one's private thoughts and a school project about a local urban legend. As the police, family members, therapist and girls themselves try to piece things together, it appears that there is more to what happened at the rail-yard than meets the eye. I love how Gudenkauf provides little spinets and clues along the way. I had several theories which changed as new information was presented. I love books which have characters who aren't always reliable - or the Author is able to make the reader question a character’s reliability. This was a fun one as the young girls did not describe the events the same way. I didn't know who was telling the truth, who had something to hide, who was scared, and who had secrets. Plus, the girls were twelve years old, they had broken the rules and left Cora's home. They knew they would be in trouble for sneaking out if they were caught. So, as they shared information, I kept in mind their age and each's desire to get into as little trouble as possible. This was a very clever and well thought out book. I was fully invested in learning the truth. The Author created characters that the reader will care for, there are some we will question and some we may be wary of but each is interesting and compelling in his/her own way. I felt for the parents just as much as I felt for the girls. Once I got to the ending, I went back to the beginning to read it. Let me just say, I did not see that coming! This book will not be released until 2019, so put it on your list and keep it on your radar. Fans of Gudenkauf will be delighted by this book. It's another solid book which had me enthralled from the very beginning. Those who have not read Gudenkauf, what are you waiting for? This is a great book I was glued to the pages. Thank you to Park Row books and Edelweiss for providing me with a copy of this book in exchange for an honest review. All the thoughts and opinions expressed in this review are my own. Debra Samantha wrote: "Well, you certainly convinced me to read this book! I shall check this out soon! 👍🏼"
A vicious attack at the railway. One young girl left maimed and bleeding, with another victim almost catatonic...in shock. The third...surprisingly unwilling to help the authorities! Cora never really fit in with her peers. Her best friend moved away to another town leaving her alone and desperate to find new friends. Violet. The new girl in town. Sweet, quiet and unassuming. Her family recently relocated here from New Mexico looking for new beginnings. Actually, the truth Addictive and thrilling! Violet. The new girl in town. Sweet, quiet and unassuming. Her family recently relocated here from New Mexico looking for new beginnings. Actually, the truth is her family ended up here in the middle of this God-forsaken, nowhere town after their car broke down. Jordyn. The popular girl. The one that rules the school, being somewhat of a bully. Make no mistake. She is always in charge. It’s Jordyn’s way...or the highway! When a class project brings the three girls together it quickly spirals out of control. The girls’ assignment is to research urban legends. But what if the legend is actually real? Who is safe? Heather Gudenkauf writes an absolute edge-of-your-seat read that will keep you flip-flopping right up till the end. I was so delightfully surprised by the ending! It isn’t too often I get to be shocked! This one had me! Don’t miss out! Highly recommended! As always a fun and fabulous buddy read with Susanne!! Thank you to Edelweiss, Harlequin - Park Row and Heather Gudenkauf for an ARC to read and review. Well this one reeled me in, hook, line and sinker! And no there are no actual fish in this story. Fishy occurrences yes, real fish, no. Though to be honest this author and I have a good relationship between writer and reader. Three twelve year old girls, sneak out of the house on midnight, of the girl hosting the sleepover. One is discovered in terrible condition, clinging to life after being beaten and stabbed. Another is found covered with blood, in shock but otherwise unhurt. The third ran ho Well this one reeled me in, hook, line and sinker! And no there are no actual fish in this story. Fishy occurrences yes, real fish, no. Though to be honest this author and I have a good relationship between writer and reader. Three twelve year old girls, sneak out of the house on midnight, of the girl hosting the sleepover. One is discovered in terrible condition, clinging to life after being beaten and stabbed. Another is found covered with blood, in shock but otherwise unhurt. The third ran home and maintains she never went as far as the railroad. Plus, none are saying what happened, blaming it on a person from an urban legend who would now be in his seventies. Have to admit I'm attracted to urban legends. We have a few in my town, one even made into the movie Munger Road. Plus, what happened to these girls? Enticing read, enticing mystery.Covers also some pertinent themes such as the harm bullying causes. How lying can ruin a person's reputation, even if the lies are proven untrue, doubt sets in. What extent a parent or guardian will go in protecting their children, and the harm of what seems at first a funny prank. So a mystery, a thriller but much more than at first meets the eye. All in all a very good read. Whoa!!! This YA mystery / thriller has exceeded my expectations! See ya, book slump! Cora is a lonely 12 year old girl, her one and only best friend moved away months ago, so when a new girl, Violet, appears in her class she is over the moon with excitement and wants nothing more than to become friends with this mysterious new girl. Unfortunately for Cora, Jordyn (the most popular girl in class and mean girl extraordinaire) is also interested in becoming Violets friend. For Cora this poses a hug Whoa!!! This YA mystery / thriller has exceeded my expectations! See ya, book slump! Unfortunately for Cora, Jordyn (the most popular girl in class and mean girl extraordinaire) is also interested in becoming Violets friend. For Cora this poses a huge problem ~ Jordyn makes her life a living hell at school by taunting and teasing her on a daily basis. Now that they have Violet in common it appears that Jordyn has accepted Cora into her circle of friends. Cora arranges a sleepover at her house for just the three of them. After midnight these young ladies make a decision that will haunt them forever. How did it come to be that Cora was found bleeding out and nearly dead on the train tracks? How did Violet become covered in blood while walking out from the woods in the distance? And where exactly is Jordyn? You'll have to read this to find out. I was completely gripped in this mystery from the very first page but I will admit as I neared the end I thought "OH NO, DON'T LEAVE IT LIKE THIS" (I was ready to chuck my kindle into the wall) but as I turned those final pages I had my AHA moment. I see what you did there, Ms. Gudenkauf, and I applaud your cleverness. 4 *what the hell is going on* stars! Twelve-year-old classmates, Cora, Violet and Jordyn sneak out one night to visit the abandoned train yard at the edge of town. A night of sneaky mischief ends with Cora hospitalized with several stab wounds and Violent and Jordyn in shock and confusion as to what happened. Small town secrets are uncovered as the police question everyone connected to the three girls. Were all three girls victims of this brutal attack? Could one of the girls b 3.5 stars. A haunting crime in a small town community. If Mean Girls and Slenderman had a baby, Before She Was Found would be that baby. An attempted murder scene, three preteen girls, one missing, one covered in blood and one clinging to life. And all three are utterly unreliable narrators. I mean, what's not to love about that? The best word I can find to describe this book is gripping. I read it in one sitting, though technically I was lying but whatever, tomayto-tomahto. Having never even heard of Heather Gudenkauf I had no idea what to expect fr If Mean Girls and Slenderman had a baby, Before She Was Found would be that baby. Having never even heard of Heather Gudenkauf I had no idea what to expect from this book and oh mylanta was I ever unprepared for what a lay ahead. I was completely absorbed from beginning to end with not only the mystery, but with the perfectly fleshed out characters. It takes a pretty clever resolution for me to not have a mystery figured out before the reveal but this one got me. Hook, line and sinker. Never saw it coming, never even considered it for one tenth of a second. I challenge anybody that figures out the culprit to reveal themselves so I can call them a liar, liar, pants on fire. 4.5 Stars ⭐ rounded up because it was unputdownable. 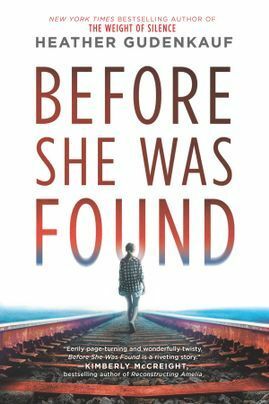 Before She Was Found starts off with an unsettling, disturbing and grisly scene and I was turning those pages as fast as I go to unravel what happened. We learn of an urban legend and I was intrigued by it and enjoyed how that played into the story. The suspense and tension in the story increases with each page until that unsettling realistic ending that left me quite upset. I have not had a reaction to a story like I did to this one. I really dislike the ending and had mixed feeling with the way it all came together but I loved the story and the themes and messages that Heather Gudenkauf explored in this story. Mary Beth *Traveling Sister* Excellent review, Susanne! I loved this one too until I got to the ending. Twelve year old Cora is found at an abandoned train depot, lying near the railroad tracks, with a broken arm, a stab wound in the torso, and lacerations and blunt trauma to her face. She had been at a sleepover with two other 12 year old girls, Violet, who was found covered in blood, in the same area as Cora and Jordyn who showed up at home not long after Cora was attacked. Cora can't talk and the other two girls are too scared to or don't want to talk. This is a living nightmare for law enforce Twelve year old Cora is found at an abandoned train depot, lying near the railroad tracks, with a broken arm, a stab wound in the torso, and lacerations and blunt trauma to her face. She had been at a sleepover with two other 12 year old girls, Violet, who was found covered in blood, in the same area as Cora and Jordyn who showed up at home not long after Cora was attacked. Cora can't talk and the other two girls are too scared to or don't want to talk. This is a living nightmare for law enforcement, parents and guardians, the preteens and teens who like to hang out in dark and lonely places, and the city. We learn what led up to the attack from the point of view of Beth, Violet's mom, Thomas, Jordyn's grandfather, Cora's diary, and texts between various kids and others. Social media and bullying adversely affect the lives of the community and there is also an urban legend that is rumored as having something to do with the attack. I was so interested in finding out what happened to Cora but reading this book is hard to do, knowing the injuries Cora received and the sad way the preteens and teens treated each other. Many things led to this attack, including what the parents and guardians chose to ignore about their children and their community. marilyn Diana wrote: "Sounds like one of those intriguing, yet difficult books to read. As always, great review Marilyn!" Thank you Diana. 💖 I think this book Diana wrote: "Sounds like one of those intriguing, yet difficult books to read. As always, great review Marilyn!" marilyn Meredith wrote: "Fabulous review, Marilyn!" WOW! This was mind-blowing good! I have always enjoyed Heather Gudenkauf's books but boy did she knock this one out of the park ladies and gents! This exceeded my expectations in every way! An attempted murder case, three twelve year old girls, one covered full of blood, one on the verge of dying, and another that left the scene. Talk about addicting and thrilling! I was totally gripped in and mesmerized by Gudenkauf's words from the start. She lays out the characters with such depth and the sto WOW! This was mind-blowing good! I was totally gripped in and mesmerized by Gudenkauf's words from the start. She lays out the characters with such depth and the story takes off from the first scene! There was SOO many things running through my brain about what was going on with this mystery. And man.... Heather did you fool me girl! Wow... you got me ;). THIS WAS FANTASTIC! You don't want to miss this book people PERIOD! I highly recommend for my mystery and thriller fans! 5 stars! Yup... people read em and weap! I'm giving this my FULL five stars.... which many of you that watch my reviews know this RARELY occurs. So hurry up get your hands on this. Huge thank you to Netgalley and Harlequin/Trade Publishing for the arc in exchange for an honest review. One night f 4 Stars! Libby Great review Meredith! I have this one on my TBR list and your review has me convinced this is a good choice. As soon as I started reading "Before She Was Found" by Heather Gudenkauf, I knew this was going to keep me reading well past my bedtime and I thought it an exciting and addictive read, that kept me entertained from the very first page. I loved all the different voices and variety in styles of narration. Multiple points of view are my favourite way of engaging with a story and reading about each character's involvement in the story from their viewpoint makes for a very interesting and entertainin As soon as I started reading "Before She Was Found" by Heather Gudenkauf, I knew this was going to keep me reading well past my bedtime and I thought it an exciting and addictive read, that kept me entertained from the very first page. I loved all the different voices and variety in styles of narration. Multiple points of view are my favourite way of engaging with a story and reading about each character's involvement in the story from their viewpoint makes for a very interesting and entertaining read. I can only imagine how difficult it must be for an author to get the different perspectives balanced correctly but Heather had got this perfect and the quick change chapters kept my interest piqued. The setting of the story was Iowa and made for an excellent backdrop, it was truly atmospheric and not an area I remember reading about before. Depicting typical small town on/off teenage friendships and dramas of young girls, not realising the disturbing consequences and impact their actions have, was very realistic. I liked reading how they got involved with the class project they chose on the town's urban legend 'Joseph Wither' and how each of their opinions affected their friendship. The author based her timely and modern story on the misuse of social media and how the issues of bullying, pretending to be someone else in chat rooms and the perils of unsolicited internet use affects people in today's society. The love of a child and the determination to protect that child, was an excellent focus of the story too and as a parent I could totally relate to. The denouement was just brilliant and really brought everything together that happened on the night of the attack. Creepy, compelling and highly addictive, I'd happily recommend "Before She Was Found" and although this was a new author to me, I now know she was written other books previously and will hopefully be looking them up to read soon too. Miriam Smith Paula wrote: "I love it when you can’t put down a book! Doesn’t happen often enough...delightful review, Miriam!" Melissa Fantastic review, Miriam! Gotta love those books that keep you up past your bedtime. 🤣 I'm hoping to get to this one sometime soon. BEFORE SHE WAS FOUND by HEATHER GUDENKAUF is an unsettling, dark, realistic, captivating, thought-provoking and fabulous thriller that pretty much had every aspect that I absolutely love in my thrillers. A haunting and chilling crime, a myst Gripping, chilling, & mind-blowing stuff here! Holy smokes! This one grabbed me by the throat on the first page and didn't let up until the last. This was the kind of book I walked around my house reading while hoping no one needed anything. Three 12 year old girls, "frenemies" by any definition, are having a sleepover. Why did they end up at the train tracks? Who attacked Cora so viciously and why? What do Violet and Jordyn know? Who's telling the truth? Which end is up? Help, I smell blue! The pressure built and built until the whole thing Holy smokes! This one grabbed me by the throat on the first page and didn't let up until the last. This was the kind of book I walked around my house reading while hoping no one needed anything. Three 12 year old girls, "frenemies" by any definition, are having a sleepover. Why did they end up at the train tracks? Who attacked Cora so viciously and why? What do Violet and Jordyn know? Who's telling the truth? Which end is up? Help, I smell blue! The pressure built and built until the whole thing came roaring together and it was so surprisingly satisfying!! Telling this story from the POV of the girls, the psychiatrist, the parents, and the police reports in a way that is not remotely confusing is no small feat, yet Gudenkauf pulls it off seamlessly. This is five stars all day. ALL OF THE STARS!! All OF THEM! A timely and gripping thriller about three teenage girls sneaking out in the middle of the night that had me on the edge of my seat. Twelve-year-old Cora Landry and her friends Violet and Jordyn, were having a sleepover. They decided to sneak out in the middle of the night to go to the abandoned rail yard on the outskirts of town. Little do they know that their fun and games will have serious consequences. Later that night, Cora Landry is discovered on the tracks, bloody and clinging to life, her friends are nowhere to be found. Who would want to hurt a young girl like Cora—and why? During an investigation there are many suspects and no one can be trusted—not even those closest to Cora. Before She Was Found is a timely and gripping thriller about friendship, bullying and betrayal. It’s about the power of social pressure and the price of needing to fit in. Cora, Violet and Jordyn’s characters were so typical of twelve year old girls. Heather Gudenkauf graduated from the University of Iowa with a degree in elementary education, has spent her career working with students of all ages and continues to work in education as a Title I Reading Coordinator. Heather lives in Iowa with her family and a very spoiled German Shorthaired Pointer named Lolo. In her free time Heather enjoys spending time with her family, reading and hiking. She is currently working on her next novel. Thanks to NetGalley, Heather Gudenkauf and Park Row for an advance reading copy of this book in exchange for an honest review. Another Chilling and Unputdownable novel by one of my favorite authors, Heather Gudenkauf! 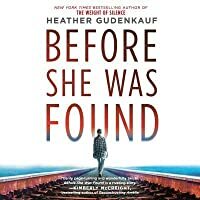 Before She Was Found by Heather Gudenkauf is a gripping and unputdownable thriller you don't wan Another Chilling and Unputdownable novel by one of my favorite authors, Heather Gudenkauf! Before She Was Found by Heather Gudenkauf is a gripping and unputdownable thriller you don't want to miss! I was very excited to read this as I've read all of Heather Gudenkauf's books and loved them all. I was not disappointed! The first text message between Violet and Jordyn grabbed my attention and the suspence never lets up! Several twists caught me off guard and sent my mind scrambling to figure out the what happened. Needless to say, I didn't even come close to figuring it out and was astounded when the answer was revealed! Heather Gudenkauf is one of my favorite authors and she's proven once again why, with another edge of your seat, chilling, and suspenseful novel! If you haven't read her books you're missing out! My favorite was the audiobook edition of Little Mercies! Heather Gudenkauf is one of the most reliably excellent authors I've ever read, so I was delighted to read an early copy of Before She Was Found. The story is about three pre-teen girls who sneak out to the train tracks during a sleepover. One of them ends up almost dead. Told through numerous journal entries, text messages and therapists notes, as well as the parents and girls themselves, we unravel the story of what happened to Cora, the girl who ended up near death, as well as who tried to ki Heather Gudenkauf is one of the most reliably excellent authors I've ever read, so I was delighted to read an early copy of Before She Was Found. The story is about three pre-teen girls who sneak out to the train tracks during a sleepover. One of them ends up almost dead. Told through numerous journal entries, text messages and therapists notes, as well as the parents and girls themselves, we unravel the story of what happened to Cora, the girl who ended up near death, as well as who tried to kill her. There was literally no point where I guessed the truth. I just didn't know who was telling the truth and who was lying. A cleverly crafted, beautifully told tale full of twists and turns, Before She Was Found explores friendship, betrayal, family, and how far parents will go to protect their children. It takes a very close look at the dangers of social media and how vulnerable adolescents are to their peers and social pressures. I found it highly relevant in the age of Slenderman. Check out my fun and fascinating Q&A Elevator Interview with Heather Gudenkauf and learn the inspiration behind BEFORE SHE WAS FOUND “highly-anticipated" psychological thriller, plus exclusive facts about the author—April 16. UNPREDICTABLE! Psychologically Rich, Timely, Character-driven, Twisty, and Loaded with Riveting Suspense. An avid fan (have read all her books), Heather Gudenkauf returns following Not a Sound my Top Books of 2017 with a brilliantl Check out my fun and fascinating Q&A Elevator Interview with Heather Gudenkauf and learn the inspiration behind BEFORE SHE WAS FOUND “highly-anticipated" psychological thriller, plus exclusive facts about the author—April 16. An avid fan (have read all her books), Heather Gudenkauf returns following Not a Sound my Top Books of 2017 with a brilliantly crafted thriller BEFORE SHE WAS FOUND. I will have to agree with PW review: "She is at the top of her game!" Based on the Slender Man, (online meme), a fictional tall, spidery figure with a blank face and the subject of short stories, videos, artwork, and video games. Stories of the Slender Man commonly feature him stalking, abducting or traumatizing people, particularly children. In a true account in 2014, two 12-year-old girls in Wisconsin held down and stabbed a classmate 19 times. When questioned later by authorities, they reportedly claimed that they wished to commit a murder as a first step to becoming proxies for the Slender Man, having read about it online. They also stated that they were afraid that Slender Man would kill their families if they did not commit the murder. However, in Heather’s skillful hands, in BEFORE SHE WAS FOUND, she reimagines a totally different creative story with her own signature style. She cleverly balances a sophisticated unputdownable psychological thriller of obsession, frenemies, betrayal, the dangers of social media, age-old legends, dark secrets of a rural railroad town and a strong multi-generational character study —the lengths family members go to protect their loved ones. Expect the unexpected. No way to guess how this one will turn out. Set in the rural railroad town of (fictional) Pitch, Iowa—we meet three different twelve- year- old girls. In Cora, Violet, and Jordyn. They become friends (or frenemies). They come from three different families (multi-generational). Jordyn (raised by grandparents), Cora (two-parent home), and Violet (raised by a struggling single mom). These family dynamics are fierce and each parent or guardian has their own parenting style. The girls decide to do a school report on an urban legend, Joseph Wither. However, the lines become blurred between "fact and fiction" and one of the girls begins communicating with someone online in a chat room. He claims to be Joseph Wither. Who is this person and is he the real Joseph Wither? Events quickly spiral out of control. A tragic event at the railroad tracks turns everyone’s lives upside down and those related to these three girls. Who stabbed Cora? What happened to Cora and the events leading up to BEFORE SHE WAS FOUND? (perfect title). From the intense pressures of social media, betrayal, and the mastermind behind the online mask, luring these girls to the tracks. From extensive text messages between the girls, the parents, a psychiatrist, police, a teacher, grandfather, to Cora journals—the suspense is riveting keeping you glued to the pages! The setting is chilling. Abandoned railroads, tracks, and trains are mysterious and dangerous as it is. They serve as vivid metaphors. Lives become derailed. Lives get off track, as noted in the novel. In the case of this small rural town, the setting is very atmospheric. Some of the residents are looking for a way out of their life. BEFORE SHE WAS FOUND is a cautionary and timely tale. A multi-layered, morally complex, seething with fear, the unknown, danger, mystery, and suspense. From the gritty atmosphere, the electrifying plot and twists and turns —the author skillfully balances the many different character voices, text messages, journal entries, therapist’s notes, and police interrogations. Impressive. A special thank you to Park Row and NetGalley for an advanced reading copy. This book gave me the chills! Three 12-year-old girls get in way over their heads at a sleepover and one of them ends up almost dead, leaving the small town stunned. Who could do this? A thriller that kept me guessing until the end! We have Cora, Violet, and Jordyn and a complicated friendship. Violet is new to town and trying to make friends. Cora is looking for a new best friend and Jordyn is the queen bee. There is some bullying and teen behavior that typifies middle-school girls. He's Coming! We have Cora, Violet, and Jordyn and a complicated friendship. Violet is new to town and trying to make friends. Cora is looking for a new best friend and Jordyn is the queen bee. There is some bullying and teen behavior that typifies middle-school girls. The girls’ parents get drawn into the aftermath of the tragedy and there are some interesting dynamics there! Some of the adults don’t exhibit model behavior, justified as protecting the ones they love. These characters seem like a powder keg just waiting to go off! Gudenkauf uses some interest storytelling tools: text messages, psychologist notes, and some chapters from a diary that start to put the pieces together, but I was way off on my guesses for this one. I started to suspect everyone, and the author was so clever. This was my fourth Heather Gudenkauf book and she remains a consistent go-to author for a thriller that does not disappoint. Melody McNamara Wonderful review, DeAnn! I don't always like this author, but this one sounds really good! DeAnn Melody wrote: "Wonderful review, DeAnn! I don't always like this author, but this one sounds really good!" Thanks Melody. I do hope you enjoy it when y Melody wrote: "Wonderful review, DeAnn! I don't always like this author, but this one sounds really good!" This was a fantastic read. I never could have guessed the final direction it would take. It is one of the best psychological thrillers that I have read. The main characters Cora, Violet and Jordyn were all very well thought out and I was very sympathetic to each of them, they were also very complex characters and it was hard to sort out which direction the story was going. I was trying to figure it all out right up to the very end and it took me totally by surprise. The title Before She Was Foun This was a fantastic read. I never could have guessed the final direction it would take. It is one of the best psychological thrillers that I have read. The main characters Cora, Violet and Jordyn were all very well thought out and I was very sympathetic to each of them, they were also very complex characters and it was hard to sort out which direction the story was going. I was trying to figure it all out right up to the very end and it took me totally by surprise. The title Before She Was Found was a very telling one, one that only reveals itself when reading. This is a dark and disturbing, slow-burning read with an interesting twist at the end. The book started out capturing my interest with the poor little girl found near dead. As the story developed I liked how the author broke the book into small chapters focusing on one character and time frame at a time. This is such an amazing and well written book by Heather Gudenkauf. If you are looking to read a book that will have you intrigued and captivated from page one, then Before She Was Found is the book to read. This book was written so well that I was not able to figure out the truth of “who done it” until the reveal. This book left me breathless and I read it in one sitting. It was beautifully written, the characters felt like people I knew. The ending took me completely by surprise and left me stunned. Definitely one of the best books I've ever read, it will stay in my mind for a long time. I can't remember the last time a story affected me so deeply. I often know the who and the why soon in a novel. Not here. I enjoyed this book immensely and found myself intrigued and horrified at the same time. In the end there were so many lives destroyed. This book should make you stop and think. It did me. That is what a good book should do. I totally recommend this book to all who love a good psychological thriller that will keep you guessing until the end. Thank you NetGalley, HARLEQUIN – Trade Publishing, Park Row and Heather Gudenkauf for the opportunity to read this book in exchange for an impartial review; all opinions are my own. This is one of the best thrillers I have read in a long time! I am so glad that I picked it up on a whim and started reading it because once I started I couldn't stop! The only bad thing is that this book doesn't release until April 2019 so readers will have to wait to read it. But I promise you, once you do, you are going to love it! This book is one thrilling ride from start to finish. In vain of Slenderman and The Chalk man, this book depicts three young girls and the urban legend of Joseph Wither. Joseph Wither is a fictional legend who is said to keep the girls he loves and dispose of the others. While he was once real in the town of Pitch he is now the ghost of peoples nightmares. So what happens when this legend is unleashed? Well, you will have to read to find out! I have always been drawn to fictional tales about urban legends and of course the Slenderman legend has found it's way into the thoughts of many books and people in the past two years. Having read a few books that depict this type of legend I have been really disappointed though. I always want to hear from the victims and the people who are dealing with the aftermath of his presence. Thankfully, this book gave me everything I wanted! Told in dual point of views, text messages, and journal entries readers will finally get the whole story! Heather Gudenkauf SLAYED it. I think the twist at the end was original as well and something that not many people will figure out! Heather Gudenkauf has been a must-read author for me since I read These Things Hidden in 2011. For an author to stay so strong on my radar for all these years is pretty impressive in my book (pun intended). In Before She Was Found, three pre-teens - Jordyn, Violet & Cora are attacked at the train tracks down in the bad part of their small town in Iowa - while Jordyn escapes unscathed, Cora is badly injured and Violet is emotionally traumatized. Told in alternating perspectives from journal e Heather Gudenkauf has been a must-read author for me since I read These Things Hidden in 2011. For an author to stay so strong on my radar for all these years is pretty impressive in my book (pun intended). In Before She Was Found, three pre-teens - Jordyn, Violet & Cora are attacked at the train tracks down in the bad part of their small town in Iowa - while Jordyn escapes unscathed, Cora is badly injured and Violet is emotionally traumatized. Told in alternating perspectives from journal entries, text messages, doctor's notes and various family members of the girls, the story begins to unfold and the secrets come out. In true Gudenkauf fashion, you will feel drawn to these characters, want to shake some of them and scream at them and hug others, but most of all, you will want to understand what happened to them and their secrets are. I highly recommend picking this one up in 2019 because it's just too good not to. Heather Gudenkauf has done it again. She manages to merge engaging characters and terrifying topics resulting in unputdownable suspense set in a small Iowa town. In Before She Was Found, Gudenkauf takes us into the lives of three young girlfriends as a sleepover turns into tragedy. Examining today’s realities of social media and the added pressure our connected culture creates, Gudenkauf has crafted a gripping thriller. I read this book along with some friends in the group, The Traveling Sisters. There were mixed feelings about the novel, but I was one of the ones that enjoyed it. The book is about three -12-year-old girls who sneak out of their house while having an overnight and go to a train yard. ..Where they believe they will meet up with a boy who supposedly died when he was 17, Joseph Whither , who takes little girls with him. He could be a ghost, or is he a real life boy like he says he is and he never died. Cora the main character believes that he lives forever and he wants to take her with him to be one of his special beloved girls. The creep factor in this book is high. The story starts out intense. We find Cora has been beaten at the train yard and may not survive. Her two friends, Jordyn and Violet, seem to be victims as well, at least initially. We soon see why these two thoughtless “mean girls” become suspects in the crime. The story is told by sharing entries from Cora’s diary, text messages, police recordings and interviews, and first person point of view from some of the parents and from a psychiatrist. It's a touchy subject no doubt. What is particularly disturbing is that it is a based on a true story. Before She Was Found was a page turner for me and a quick read. I especially enjoyed reading the author's note at the end and looking at the questions for discussion. Lots to talk about here. It's out today and I highly recommend it. Great suspense and timing. Well developed characters and solid plot. Violet, bloodied and traumatized emerges from the darkness into her mothers arms. Cora lies nearby near death, Jordyn nowhere to be found. The sixth-graders snuck out after midnight to find Joseph Wither. Legend says as a teen he burnt down his house, killing his family over a lost love. According to town folklore, he kidnapped and murdered other young women over the years. For a class project, the three girls research Joseph, convincing Cora he’s still alive. I make no secret that I’ve been a Heather Gudenkauf fan since the Weight of Silence. I’m also a true crime buff, especially psychological crime involving children. I followed the Slenderman attacks and subsequent documentaries. At first glance, BEFORE SHE WAS FOUND might seem ripped from the headlines, but Gudenkauf created such an intricate, tight plot you won’t know how alike or similar the stories are until the very last page. If I had asked Gudenkauf to write a book for me, she would have penned BEFORE SHE WAS FOUND. I’ve read good books and bad books, books that stayed with me forever, books that blew my mind and books I’ve re-read more than ten times. Never before have I read one that hit all my interests nearly perfectly. Gudenkauf’s writing gets crisper and cleaner every time, her characters more layered and nuanced. BEFORE SHE WAS FOUND utilizes text messages, journal entries, Violet’s mother’s first person point of view, Jordyn’s grandfather’s limited third person POV and personal notes from psychiatrist Dr Madeline Gideon’s to show (not tell) the story. The plot had me guessing until the very last page with a number of viable suspects from the girls to a teacher to Violet’s brother’s friend to Joseph Wither himself and of course, others I placed lower on the list of possibilities. The last quarter of BEFORE SHE WAS FOUND was not stop action, twists and turns that felt organic to the story. Avoid reviews with spoilers, each revelation is a gift. The stage is set when three 12-year-old girls become friends. Cora, born and raised in the town of Pitch, is timid and lonely. Jordyn, also ra Bestselling author Heather Gudenkauf paints a graphic picture of what happens when three young girls are placed into a toxic environment caused by family influence, small town mentality, childhood cruelty and pranks. Told from multiple points of view, Before She Was Found is both thrilling and a dark reflection on teenage issues and the adults around them. The girls are assigned a group project in class requiring they choose and research an urban legend. The girls choose urban legend Joseph Wither – a decades old murderer from the town of Pitch. What starts off as a simple research project quickly turns into obsession. When someone claiming to be Wither says he’ll be at the towns abandoned rail yard, the girls can’t resist. During a sleepover at Cora’s, the girls sneak out hoping to prove once and for all whether or not Wither is real. But that’s not their only motive… What follows is the discovery of a shocked Violet covered in blood, Cora beaten on the tracks and Jordyn nowhere to be found. Gudenkauf's unique narrative lures the reader into the minds of these girls, their families, a judgmental community and the psychology behind the why of it all. She crafts an engaging mystery thriller, walking the reader through a maze of potential perpetrators and events leading up to the horrific discovery of Cora’s beaten body. Ultimately, leaving behind the devastation of not only the three girls but an entire community who will forever be scarred. While incredibly well written, I thought it was a bit predictable and the character development somewhat uneven. I also felt that nearing the end, the story had lost some of its momentum. It could have ended a bit sooner. However, overall, I enjoyed the book and those of you who love thrillers should definitely get your paws on it! I have been a fan of Gudenkauf since I read Not A Sound . There's just something about her writing style that really resonates with me and keeps me glued to each and every word. I was actually surprised to find that this was a YA thriller - but it's only YA in terms of the twelve-year old girls that are the main three kids involved in this creepy storyline. Outside of that, I did not feel that it read like your typical YA at all. Don't get me wrong, I'm a fan of YA books, and also psychological I have been a fan of Gudenkauf since I read Not A Sound . There's just something about her writing style that really resonates with me and keeps me glued to each and every word. I was actually surprised to find that this was a YA thriller - but it's only YA in terms of the twelve-year old girls that are the main three kids involved in this creepy storyline. Outside of that, I did not feel that it read like your typical YA at all. Don't get me wrong, I'm a fan of YA books, and also psychological thrillers (as you all well know) - have them marry up and here we are folks! Heather is the NYT and USA Today Bestselling author of THE WEIGHT OF SILENCE and NOT A SOUND.